AN-PA-CWDM passive 4, 8 and 16 channel CWDM multiplexer series dramatically decreases fiber laying and renting costs by combining up to 16 CWDM wavelenghts and sending them over same fiber pair. Now, here let us show you interesting scheme, how we can multiplex 4 or more 1310 nm based Gigabit Ethernet channels, over same fiber pair using these CWDM multiplexers. As you can see in video, first we use our Gigabit Media Converter, and then by means of SFP-SFP fiber converter, we convert 1310 nm to CWDM 1490 nm wavelength, which then goes injected further in CWDM multiplexer. In above example it’s 4 channel CWDM mux, but ordering options are 8 or 16 channels. 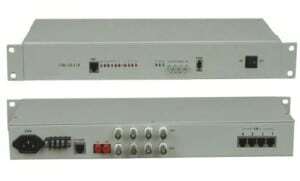 AN-PA-CWDM the product uses 1U rack design, can be installed in a standard 19-inch rack can support 20nm apart between 1270nm ~ 1610nm CWDM wavelength multiplexing and demultiplexing , and have upgraded features.